A liquid diet, in which you consume a mixture composed entirely of lemon juice, maple syrup, and cayenne pepper, for a minimum of 10 days. It was first proposed in the 1940s to treat ulcers and detoxify the body, and was recently made popular as a method for quick weight loss. There is absolutely no scientific evidence that cleansing/detoxification liquid diets offer any health benefits, besides possibly a placebo effect. The Master Cleanse, also known as the Lemon Cleanse or Maple Syrup Diet, was first proposed by Stanley Burroughs in the 1940s. It was made popular recently with the publication of Peter Glickman’s book Lose Weight, Have More Energy and Be Happier in 10 Days. It was proposed as a diet to eliminate cravings for junk food, sodas, coffee, and other habit-forming foods and beverages. The other proposed benefits were removal of toxins from the body, treatment of ulcers, and a cure for “any kind of disease.” On the diet, an individual is only allowed to consume a mixture of lemon or lime juice, maple syrup, cayenne pepper, and water. A search of the scientific literature revealed no studies conducted to test the effectiveness of this diet. Only anecdotal evidence is available, which is circumstantial and cannot be used to determine efficacy. There is no scientific evidence that the Master Cleanse, or any other all carbohydrate, low calorie, liquid diet provides any health benefits.Because no research studies could be located which directly tested the ability of the diet to produce the claimed results, a review of the various concepts involved with the diet will be addressed. Maple syrup: Maple syrup is a nutritive sweetener, meaning it provides calories. Maple syrup is not functionally very different from high fructose corn syrup. As seen in Table 8.1, maple syrup is composed primarily of sucrose. Sucrose is a disaccharide (a sugar composed of two units) built with one glucose and one fructose unit. 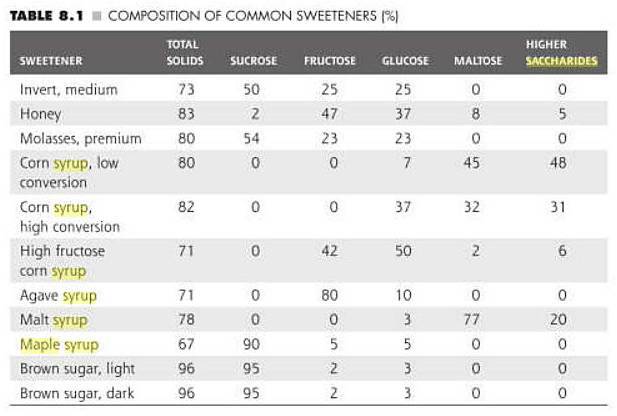 As seen in the table, high fructose corn syrup contains proportions of glucose and fructose similar to those found in sucrose. The only difference between maple syrup and high fructose corn syrup is the bond which links the glucose and fructose molecules in the sucrose found in maple syrup. This bond is easily broken in the stomach by acidic hydrolysis. By the time maple syrup enters the stomach it is broken down into its component units of glucose and fructose and is therefore functionally no different from high fructose corn syrup. Because very little absorption of glucose and fructose occurs in the mouth, the absorption rates of both types of syrups are identical. In essence, consuming a mixture which contains a considerable amount of maple syrup is no different than consuming a drink which contains high fructose corn syrup. The Master Cleanse mixture will produce metabolic effects essentially the same as those seen after consumption of a sugary soft drink. This is not the basis of sound nutritional decisions. Cayenne Pepper: The active ingredient in cayenne pepper is capsaicin. It has traditionally been used as a topical treatment to relieve pain. It is believed to bind to sensory neurons which relay pain signals to the brain. By binding to these neurons it depletes a particular neurotransmitter making it impossible for the neurons to transmit signals for pain. Other proposed health benefits include: increased metabolism, increased lipid metabolism, and enhanced ability to maintain blood glucose levels. The research studies conducted to study these hypotheses have found mixed results. While some show possible health benefits, others determined that there was no correlation between capsaicin intake and any health benefits. Of those studies that found a possible correlation between capsaicin and enhanced metabolism, many of them were not conducted on humans, and therefore results cannot yet be applied to humans. Additionally, the studies tested an amount of capsaicin that accounted for at minimum 0.014% of the diet, an individual consuming this Master Cleanse mixture would not consume anywhere near this amount. Based on the recipe recommended in this diet, an individual would consume approximately one tsp of cayenne pepper per day. This would amount to only 0.0000101% of the individual’s diet. Therefore even if there were health benefits to be gained from the consumption of cayenne pepper, it would require the consumption of substantially higher amounts than the Master Cleanse diet provides. The digestive tract is immensely important for the immune system. Approximately 70% of the body’s immune system in found in the gut. Gut-associated lymphoid tissue (GALT) is responsible for the production of many immune cells and hormones that defend the body against pathogens. In decades past, individuals with serious digestive tract problems were placed on intravenous feedings which supplied energy directly into the blood. Recovery rates from such procedures were found to be remarkably low, and it was found that in order to maintain the efficacy of the GALT it was required for food to pass through the digestive system. Now individuals are placed on tube feedings with the tubes emptying into the stomach or small intestines. The differences between a solid versus a liquid diet may be produced by a similar mechanism. Studies conducted on the use of liquid diets versus solid diets have found that antioxidant defense was higher when consuming a solid diet. Antioxidants play an important role in the immune system, but eliminating free radicals that can cause damage to cells, and potentially lead to cancer. Therefore a solid diet is recommended to produce an increased antioxidant defense leading to a stronger immune system. A detoxification process is unnecessary. The human body has multitudes of mechanisms to detoxify itself. The kidneys and the liver are designed specifically to eliminate toxins, although for certain substances this process can take several days. Consuming what is essentially a blend of Vitamin C and sugar would not help speed up the body’s natural detoxification process. The only possible benefit to the consumption of the mixture proposed for the Master Cleanse diet would be a psychological remodeling. This strict consumption of a mixture which may not be extremely tasty may make an individual more aware of the foods and substances which they put into their body. Choosing healthy foods may not come naturally to all individuals, and fasting for a brief time may be beneficial in clearing the mind and causing the individual to view food almost as a drug because of its impact on hormones and the metabolism. The individual may subsequently be more dedicated to eating healthy. Gropper SS, Smith JL, Groff JL. Advanced Nutrition and Human Metabolism, 5th edition. Published by Wadsworth, Cengage Learning, 2009. Weigle DS, Duell PB, Connor WE, Stiener RA, Soules MR, Kuijer JL. Effect of Fasting, Refeeding, and Dietary Fat Restriction on Plasma Leptin Levels. Journal of Clinical Endocrinology and Metabolism. 1997;82(2):561-65. Johnstone AM. Fasting – the ultimate diet? Obesity Reviews. 2006;8:211-22. Huang CY, Chen LH, Osio Y. Effects of diet composition on liver antioxidant defense and detoxification enzymes in mice with murine aids. Pergamon. Dec 1994;14(12):1841-51. Wilson JHP, Lamberts SWJ. Nitrogen balance in obese patients receiving a very low calorie liquid formula diet. The American Journal of Clinicai Nutrition. August 1979;32:1612-1616. Ruden DM, Rasouli P, Lu X. Potential Long-Term Consequences of Fad Diets on Health, Cancer, and Longevity: Lessons Learned from Model Organism Studies. Technology in Cancer Research and Treatment. June 2007;6(2):247-54. Figoni, Paula. How Baking Works: Exploring the Fundamentals of Baking Science, 2nd Edition. Published by John Wiley and Sons, 2007. Kawada T, Hagihara K, Iwai K. Effects of Capsaicin on Lipid Metabolism in Rats Fed a High Fat Diet. The Journal of Nutrition. 1986;116:1272-78. Alevizos A, Mihas C, Mariolis A. Insulin secretion and capsaicin. The American Journal of Clinical Nutrition. 2007;85(4):1165-66. Nice post. Thanks for sharing useful information.